Millennium 7 Publishing Co.: Dominating Social Media Trends Coming In 2018? 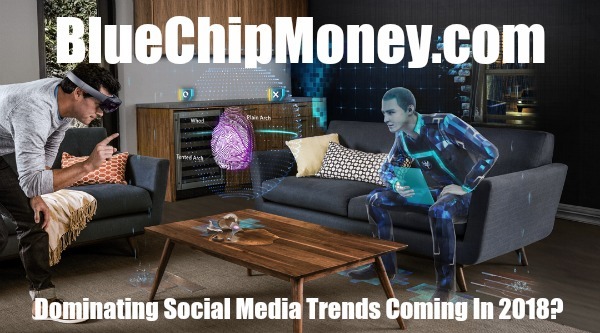 Dominating Social Media Trends Coming In 2018? How do you plan on socializing next year? How do you plan on reaching your target audience, who will be socializing with each other, next year? By default, we underestimate how our lives will change in the future. Related Article: Marketing Trends To Dominate In 2018? We tend to think of next year as ending more or less the same as this year (with the exception of any personal plans you might have). In addition, we tend to underappreciate the progress of technology, at least on a smaller scale. That’s because our favorite social media apps tend to roll out updates on a nearly constant basis, changing slightly but frequently; just as we don’t notice children getting taller day by day, we don’t always recognize how the social media landscape around us evolves. But it is evolving, constantly, and in 2018, there are going to be a handful of highly important trends dictating how that evolution unfolds. About five years ago, Google came out with a pair of glasses—Google Glass—that promised to bring augmented reality (AR) to the mainstream and change how we live and interact with each other. But now, multiple companies—including Facebook, Google, and Snap—are competing to enter or re-enter the AR ring. After a handful of highly successful AR apps, rising sales of VR headsets, and greater technological sophistication (including faster internet speeds and better visual rendering), 2018 could finally be the year that AR takes off. If it does, and stays in the mainstream, you can bet that social media will be one of the most popular applications for the technology, bringing people together over vast distances, and providing an entirely new UI for social interactions. You could make the argument that live streaming dominated 2017; about 80 percent of consumers would rather watch a live video from a brand than read a blog, and 82 percent would prefer live video to written social media updates. Live streaming statistics exploded in 2017, thanks in part to all the social platforms and other companies supporting the format. But 2018 will be an even bigger year, now that both audiences and brands have settled into the format. This is no longer a cool new way to interact with audiences—it’s an expectation for your brand. The use of social media requires the forfeiture of certain types of privacy. Though Facebook, Twitter, and other platforms have attempted to crack down on users abusing the system, and are trying to keep customers informed about their privacy rights, some users are still hungry for an app that won’t sell their information to advertisers. I think in 2018, we’ll see an increase in the number and popularity of apps that keep user privacy as a top priority, or offer open-source APIs to make users feel more comfortable with using them. Users love to interact with each other, but they also love game-like experiences—and because many companies have generated significant revenue from microtransactions and immersive gaming experiences, it’s only a matter of time before we see an app that tries to blend social media and gaming more organically. Time will tell what kind of app could result from this hybridization, but it’s likely going to make a significant impact in 2018. Early in their development, social media platforms made building a user base their highest priority. Now that they’re more firmly established and have proven their long-term viability, their biggest concern has shifted to revenue. Most major social media brands have already started shifting their focus toward building more advertising, but 2018 will see an even bigger shift in that direction. In 2017, there were more than 50 million small businesses using social media pages to interact with their customers. Social media is incredibly popular for a reason, but that increased volume of businesses is also leading to an increased presence of brand-written content. This is already leading to some signs of brand fatigue, making consumers less likely to engage with sponsored or branded content than content from independent sources. That’s going to put more pressure on brands to make better, more independently verifiable sources. Partially as an extension of the brand fatigue, 2018 will be a year for more local and personal experiences. With Google putting a higher emphasis on search results for local companies, and online consumers wanting more local, interpersonal interactions, I expect to see an increase in the number of local business owners reaching out to individuals, and doing more to engage with their respective communities. This is going to be a benefit for both entrepreneurs and consumers, as well as the communities in which they reside. Are these trends going to completely change how brands and consumers use social media? I doubt it, but we’re in for one interesting year. If you want to remain competitive in the world of social media marketing, and prevent your competitors from getting ahead of you, stay tuned to the latest changes, and don’t hesitate to update your brand strategy to fit new trends, expectations, and opportunities. Guest Authored By Jayson DeMers. Jayson is Founder and CEO of AudienceBloom. He "de-mystifys SEO and online marketing for business owners." Jayson graduated from the University of Washington in 2008 with a degree in Business Administration (Marketing), and immediately entered the professional online marketing world. He founded AudienceBloom in April 2010, and has since become a columnist for Forbes, Search Engine Journal, Search Engine Watch, and Huffington Post. Jayson guest lectures for marketing classes at the University of Washington, and currently resides in Seattle, WA. Follow Jayson on Twitter. “The more modern your campaign is, the better chances you’ll have at connecting with your audience, and differentiating yourself from the crowd.